We’re very pleased to announce that the winner of our National Black Cat Day 2016 competition is Caspar! This year’s celebration of black and black-and-white celebrates the uniqueness of black cats and focuses on what makes them individually special. After all, beauty is more than fur deep. So we asked cat lovers to help us demonstrate this to the world by sharing the photos that best showed their black cats’ personalities. 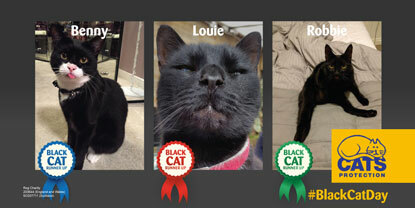 We received thousands of entries so it wasn’t easy to pick a winner but we think that Caspar was the top cat! With his sleek fur, sparkling eyes and winning personality, we hope our new feline pin-up will inspire more people to adopt a monochrome moggy, which typically wait longer to find new owners than other cats, such as tabbies and gingers. Owner Jane Scott, of Wallington, Surrey, said she and husband Andrew were delighted Caspar had been chosen as the feline figurehead for black cats. She said: “Caspar is a truly lovely cat – he is very friendly, playful and loves to be around people, so we’re thrilled he has been chosen as the face of Black Cat Day 2016. Cats Protection’s Social Media Manager Gemma Croker said Caspar was a great ambassador for black cats throughout the country. She said: “Sadly, black and black-and-white cats like Caspar wait around 22 per cent longer to find a new home than other cats such as tabbies or gingers. It’s heart-breaking, as they can be just as fun-loving, playful and affectionate as any other cat. “Caspar just goes to show just how special black cats can be and we hope he will inspire more people to open their hearts and homes to a monochrome moggy. 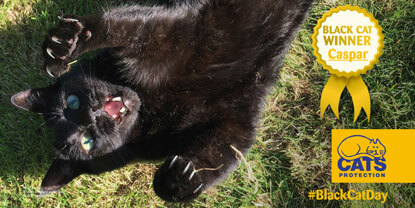 If you’d like to give a black cat a home, visit www.cats.org.uk/find-a-cat to meet needy felines in your area. We have always adopted black cats - they are totally beautiful! We sadly lost our lovely Lucifer (Luci) about 2 years ago and were heartbroken We have since adopted Daisy and Duke (brother and sister from The Blue Cross) and we are totally besotted with them - they bring so much joy to our lives. Black cats are the best. We have a ginger kitten, a 2 year old calico cat and a one year old black cat. The ginger one is a little terror, the calico is a very grumpy madam indeed and our black one is the most placid, loving, sweet natured little guy imaginable, not to mention stunningly handsome as well.